Full details of the hugely impressive line-up of presenters and trainers at Autoinform LIVE Ireland have now been confirmed and are available in an eight page brochure, which is being distributed with the February issue of Autobiz Magazine. You can also download a copy of the training brochure by clicking here. Autoinform LIVE takes place for the very first time in Ireland, in Cork, on Saturday April 27th and Sunday April 28th. It is a unique automotive training experience, that brings together a diverse line-up of aftermarket experts to provide garage owners and technicians, with a combination of demonstrations on how to tackle common vehicle repair and diagnostic issues, as well as to provide a practical insight into fast changing vehicle technology. This makes it a must for any garage looking to expand its areas of knowledge and expertise and take their workshop business to the next level. The event gives technicians and garage owners attending, the chance to see live on vehicle demonstrations of repair and diagnostic techniques, as well a presentations from leading experts in their field. 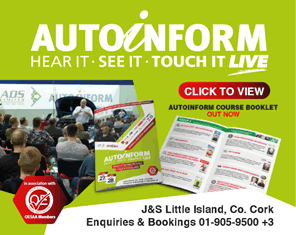 The Autoinform LIVE Ireland brochure details each training module, gives some background on the trainer and explains the benefits that each session will bring and the skills and knowledge that can be gained. The brochure also gives details on how to book your place at this unique training event. Book Online Here or for telephone bookings and more information please call 01-905-9500 and select option 3.